Mackerel is like the kid who gets picked to be on the team last. Outside of Japanese cuisine, it doesn’t get much respect. The poor things are canned more often than not, commonly smoked or cured (this is also because it must be eaten only very fresh), and considered too fishy-tasting and unimpressive in size. You won’t see it on the menu of too many restaurants, roasted or grilled as is. But when eating in, you get to be captain of your team — er, menu — and here’s why this underdog is actually a terrific choice. It’s a more sustainable seafood choice. Atlantic mackerel (also called just mackerel, or “Boston mackerel” as my fishmonger called it) aren’t rare or overfished, and they’re wild-caught throughout the year except for the warmest months. They get sound marks at sustainability trackers like at Blue Ocean Institute. Mackerel are smaller fish, lower on the food chain, and so bioaccumulation and mercury levels are relatively slim (compared to that of bigger creatures like swordfish). Plus, they’re abundant throughout the North Atlantic, so easy to get locally-caught ones in NYC. It’s flavorful. There’s something fishy here: how come it’s a good thing when beef or pork has more flavor, but not when fish do? If you truly don’t like fish, then I guess you can only eat the mildest-tasting types. But why not awaken the palate to stronger tastes — we have for lettuce greens, which are often prized for being spicy and bitter now instead of bland. Unctuous and oily, mackerel are also high in omega-3 fatty acids. Tastes a bit like another fatty, fishy-tasting fish, salmon, if you ask me. It’s inexpensive. At $6.99 a pound at Pura Vida fisheries in Union Square Greenmarket, I got four cleaned fillets for $6. They were at Blue Moon Fish at Grand Army Plaza Greenmarket for the same price. I went there Saturday to get a larger fillet for the photo at top, and that cost me a handsome $1.50. Stop telling me it’s more expensive to cook stuff yourself! Now to cooking them. You’re off to a headstart by getting fillets, which given their size need only a couple minutes on each side. You can give them a quick seasoning of salt and pepper and run with that. But if you’re shy of encountering the full force of the fish’s fishiness, go with a marinade with flavors you like. I tried a miso marinade, adapted from a recipe in Washoku: Recipes from the Japanese Home Kitchen. It’s pretty basic — white miso paste, rice vinegar, optional yuzu (a Japanese citrus similar to lemon), and time. I skipped the yuzu and smeared together the rest. The only fussy part is keeping the miso paste from direct contact with the flesh of the fish, because it’s grainy and can be undesirable in texture if lodged in. So we just keep it separated with a double-layer of cheesecloth. After six hours of marinating, the acidity in the vinegar should actually cook your fish a little, and it’ll feel firmer. Now they just need a little time under the broiler on each side. 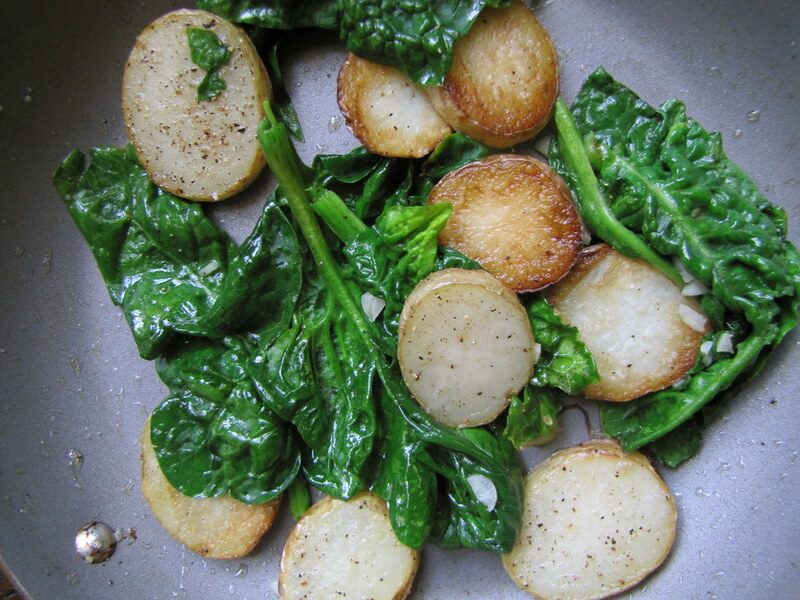 White potatoes and spinach looked nice at the market that day, and round out the dish for a quick, simple meal. Any leafy green — baby bok choy, kale — works fine, too, but since mackerel is so assertive the benign spinach seemed like a good match. A home run, this team of three ingredients. I’ll also be teaching a shortcut version of this marinade at Whole Foods Bowery next week, for a date meal-themed class. It’s a cheat, but it works wonders in a pinch. More recipes from that session to come! Pat dry the fillets. Mix together the miso and vinegar. 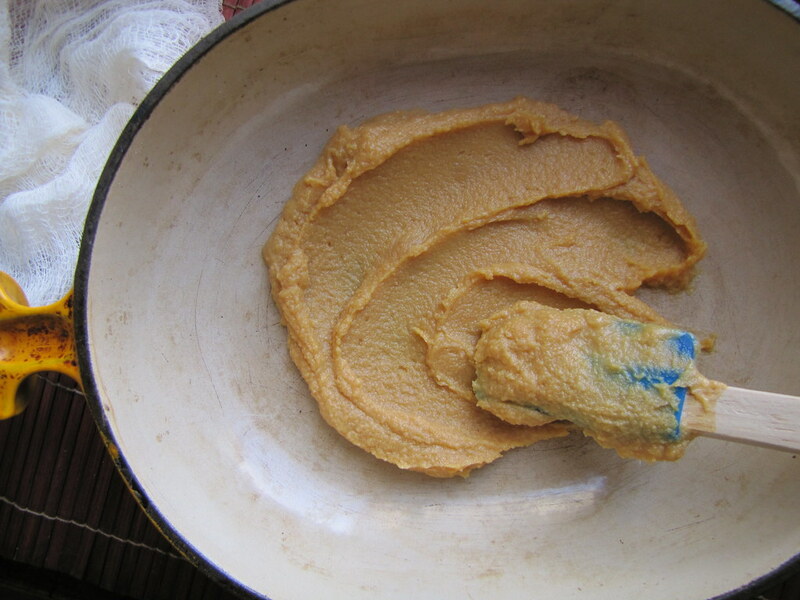 Spread about half the mixture in the bottom of a marinating dish. Place a double-layer of fine cheesecloth on top. Press the fillets firmly down, making sure the entire surface is directly on top of some marinade. 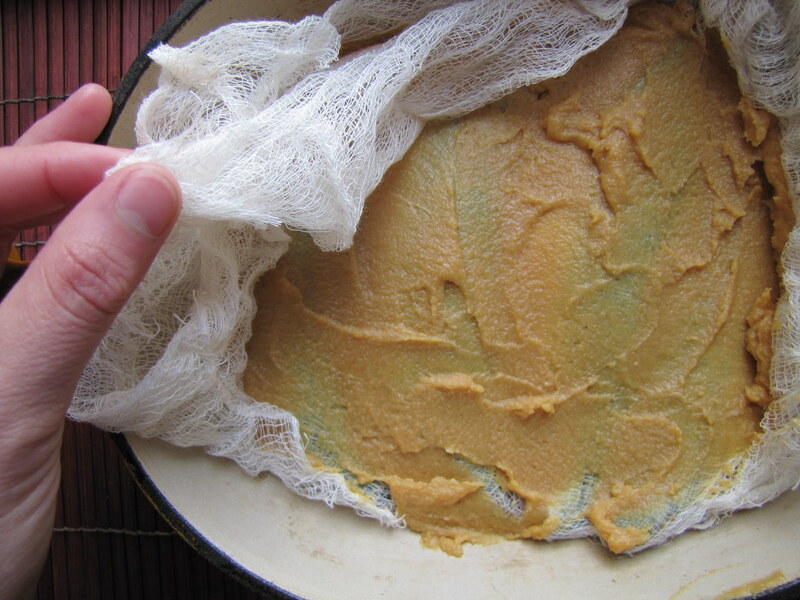 Cover with another double-layer of cheesecloth. Brush or smooth on the rest of the marinade. Cover with plastic wrap and let chill for about 6 hours or up to overnight. In a large, heavy-bottomed skillet, heat a couple tablespoons of oil and arrange the potato slices so that almost all pieces are flat against the pan. Season with salt and pepper, and let brown for a couple minutes over medium-high heat. Toss and cover to quicken their cooking without adding more oil for another couple minutes. 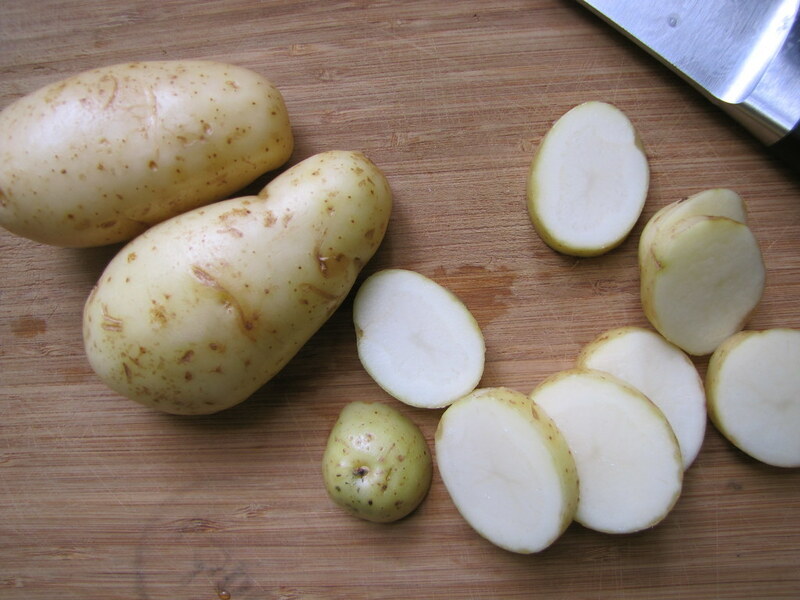 Once potatoes are tender, add the spinach and garlic, and another pinch of salt and pepper. Cook about a minute until just wilted through. Meanwhile, preheat broiler. Remove the fish fillets from the cheesecloth and place skin side-down in a roasting tray. Broil for about 2-3 minutes. Flip and broil another 2-3 minutes (depending on size) until the skin is just slightly crisped. Serve immediately with the potatoes and spinach. Three brownie points: With the plentiful omega-3 fatty acids found especially in mackerel, and only a splash of olive oil for the vegetables, this is a dish high in *good* fats. 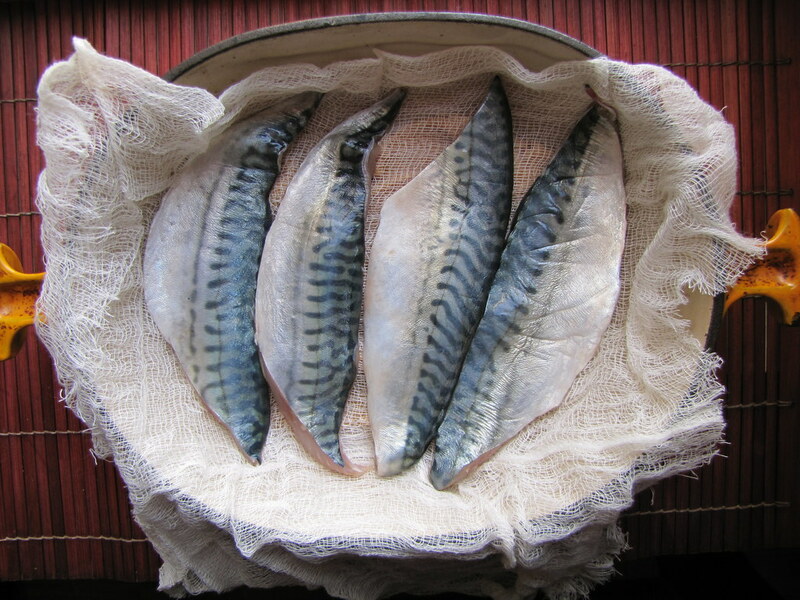 Mackerel is also high in B-vitamins like B12. 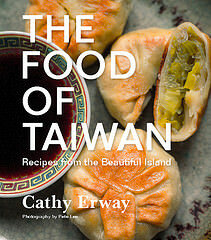 And while high in sodium, fermented soybean paste, or miso, is a good source of that, too. Of course, leafy greens will boost your immune system, and fresh spinach is a power food with Vitamins K, A, C as well as protein and iron. And unlike meat and seafood, you’re better off for indulging in it as much as you want. 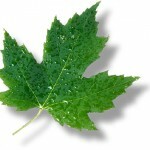 Eight maple leaves: Each of the main players of this meal was locally grown or caught, and brought to the Greenmarket last weekend. 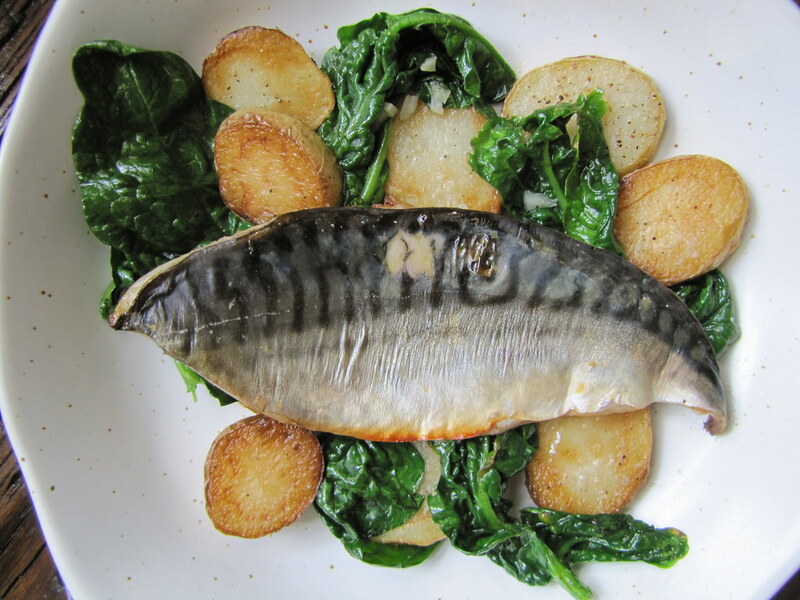 You don’t have to wait for any particular time of year to enjoy potatoes, mackerel and spinach, either. Or garlic. Miso paste and rice vinegar was not so local, alas, but I’m still pleased to find organic miso at most run-of-the-mill and Asian markets these days, which this one was. This is a huge point, I wish I would have thought of this earlier. Good blog you have here.. It’s difficult to find high quality writing like yours these days.